With every coal plant closed in favour of wind and solar energy, demand-side flexibility (DSF) becomes more important. But DSF, being able to store energy or shift consumption, has a curious feat. The longer devices hold energy or hold off consumption, the higher their cost. This fundamentally changes the economics of the power system. When flexibility in the system comes from the demand side, the costs of consuming energy at a certain time will come mostly from the storage necessary to get the energy there when you need it. Holding energy is an expense that we have to start to put on bills. It is a real and growing expense, but completely unaccounted for by current tariffs. The good news is that the momentum is now there to deal with this timing component. The Dutch experimentation scheme expected to come into force July 1st 2019 puts network operators in a unique position to try out a novel incentive system. They could easily include a timing component in their network tariffs, so that the market can account for the economics of shifting. We wrote a proposal to do just that, based on the excellent mechanism design research coming out of Centrum Wiskunde & Informatica. Their proposed network tariff separates distribution needs from the need to hold energy during the day. The novel tariff component charges grid connections for the volume and duration that they remain at a credit or debit position with respect to their average consumption within a day. A relatively simple adjustment of the network operator’s settlement process, leaving further innovation to the market: this tariff motivates end users to forecast their daily demand, to reduce their reliance on the grid to hold energy, and to aim for a flat power profile. How does it work? End users pay a price for their holding needs. In the graph, during roughly the first half of the day, the end user has used its grid connection as a battery to borrow energy from until it has been handed back by feed-in from its solar panels. To reduce this credit position and save on grid fees, the end user can delay early morning consumption away from peak hours. From late afternoon onwards, the end user has used its grid connection once more as a battery, but now to store solar energy in until it has gotten it back through its evening consumption peak. 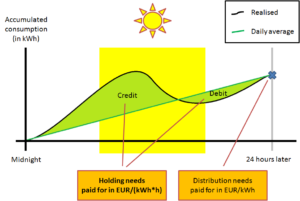 To reduce this debit position, the end user can either store its own solar energy or advance its evening peak towards daylight hours, increasing self-consumption. Both alleviate congestion. This is a good example of what is possible with mechanism design. By thinking deep about the underlying economics of a system post transition, it’s possible to find a fitting incentive structure for market players to innovate further.